It’s no secret there’s a ton of water in the Sacramento Valley on the Feather and Sacramento River, but don’t let that discourage you. 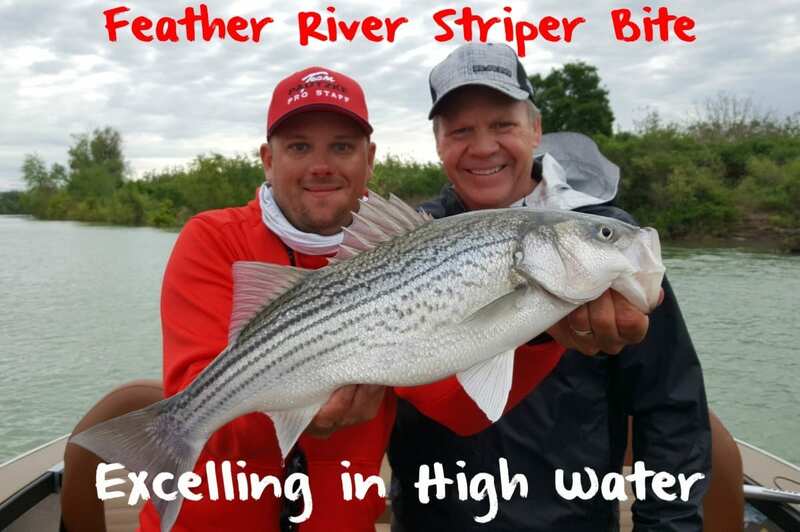 There are also more stripers than we’ve had in years and that high water is going to keep them around longer than we’re used to having them. The massive amount of water is going to make this one of the best striper seasons we’ve had in the valley since 2011. We’ve had several days where we’ve run two trips a day and caught more than 50 fish on each trip. The striper season has been nothing but spectacular since early April. Fishing was good before then, but I was down in the Delta fishing still. We are still in mid to low 50-degree water. I don’t expect these stripers to even attempt to spawn until we get to 61 degrees and warmer. I don’t expect that to happen for a while. With that said these fish are in the system, they are comfortable and they are eating. It’s been solid action. I think this run could go into July, if not further. With the water temperatures so cold it postpones the spawn. This allows more fish to entire the system and increases the inventory of fish that are in the system now. Frankly, the Sacramento and Feather are loaded with stripers right now. These fish range three to 10 pounds, but there’s fish up to 50 pounds in the system. Our average fish runs about five pounds. The normal is about 18-27 inches. There’s a lot of big water around and it’s going to remain this way. It’s changed the way we fish for stripers. Because of high water we are limited to some of the areas we want to fish, but it’s created new areas we are fishing now that weren’t accessible before the rain and high water releases. Shasta and Oroville might still be at flood stage, but with the releases it’s bringing large amounts of striped bass into the valley. Another change is using more weight than in previous years due to the higher flows. For us this is a live bait jig. When I’m in the Delta I’m trolling and using live bait. However, in the Feather and Sac I prefer to use live bait. I started the season with jumbo golden shiners. However, as soon as my samples of the new Pautzke Fire Dye arrived I’ve switched over to Chartreuse Fire Dye shiners and have been using them daily. 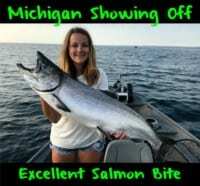 With the dirty and stained water we have right now the chartreuse baits, and its UV properties, is dramatically increasing our bites. The fishing had been so good at first it was hard to determine if the dyed minnow vs the non-dyed minnow made a difference, but at this point I’m sold that it does. We can credit that to the cold front and wind we had the last few days. It gave me the upper hand having the chartreuse minnows. I’m not going through two bottles of the dye a day. (I’m lucky I’m a pro staffer and don’t have to pay for this!). What I’ve found that’s amazing about the Fire Dye how easy it is to dye your baits. I follow the directions on the bottle for the short soak and I’ve found with chartreuse anywhere from a 25-35 minute soak (on golden shiners) seems to be optimal. Personally, because I’m dying a much larger amount of bait than a typical person I double the formula and use two bottles of the Chartreuse Fire Dye person six bottles of water. And, by six bottles I’m talking about refilling the bottle of dye with water. Keep in mind, you can’t use tap water because there’s chlorine in it. You need to use non-chlorinated water. I only double this because I’m trying to do 48 jumbos or more at a time. If you are only doing 24 one bottle is enough.When my minnows are in the solution the most crucial step to success is to make sure they are on air. You have to aerate them. Once you’ve determined that the minnows are the color you want them I transfer them to another bucket of clean water and out of the solution. I do this because it’s less messy. I’m a clean freak and don’t want dye all over my boat. At this point I’ll transfer them to the live well in my boat. If you are looking for extremely bright bait you’re soak time will be longer than if you are looking to dye the fins, tails and eyes only. Every soak can be different. Different batches of live bait react differently to the dye. I advise you check the minnows every five minutes until they are exactly the way you want them to be. Some anglers want them vivid and bright and others only want a tint of chartreuse on them. After the shiners are dyed they hold their color. It doesn’t wash away over a short period of time. I can’t tell you exactly how long the color stays, but I’ve had some in my boat for six days and they haven’t lost their color. This product is going to completely revolutionize the striped bass world. It’s changing the way we fish for our stripers. Being able to dye live bait brings us to the next level. I don’t only think I know this product will increase success fishing live bait in the Sacramento Valley. It already has on my boat. This is truly an exciting thing for me personally and I’m so exited to be on the forefront of dying baits in the Sacramento Valley. We don’t often get to be apart of something that’s truly new and different. When I set up for using live bait I use Cousin’s Tackle model 802. It’s an eight-foot rod with a sensitive, fast tip and a moderate backbone. I fish a low profile casting reel with 50-pound P-Line braid to 12-pound P-Line fluorocarbon leadfer. 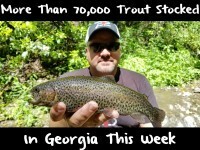 When fishing jumbo golden shiners I typically fish a size No 1 mosquito hook. While hooking the shiner I close its mouth by sticking the hook through the bottom of the jaw, out the top and between the two nostrils. You want to avoid piercing the brain. Editor’s Note: Scott Feist operates Feisty Fish Guide Service. 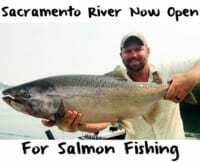 For more information on his guided Sacramento and Feather River striper trips please visit https://www.facebook.com/FeistyFishGuideService or http://feistyfish.net. *Pautzke’s new Fire Dye is available in Blue, Red & Chartreuse at the following Central/Northern California Walmart locations: Stockton, Oroville, Madera, Modesto, Susanville, Lodi, Yuba City, Crescent City, Turlock, Livermore, Roseville, Gilroy, Tracy, Merced, Chico, Fairfield, Pleasanton, Woodland, Mountain View, Placerville, Redding, Bakersfield (NW), San Leandro, Antioch, Sacramento, Fresno (N), Stockton (NW), National City, Marysville, Sacramento, Clovis, San Leandro and Elk Grove.